Audrey: Hi, my Audrey Johns. I am the cookbook author of "Lose Weight by Eating: Detox Week" and the founder of loseweightbyeating.com. Suzy Chase: I'm so happy you're back on my podcast. This cookbook was spawned from your popular Detox Diet Week blog post. Tell us about the Detox Diet Week. Audrey: Oh, absolutely. And, Suzy, thank you so much for having me back on. I'm so thrilled to be back on Cookery by the Book. When I was writing my first cookbook, "Lose Weight by Eating", I had written a post called Detox Week and put it up on my blog, loseweightbyeating.com, and it quickly took off as the number one post on the entire site. People were losing weight really quickly. They were losing up to 18 pounds in a single week, and some of the people who only had maybe 10 pounds to lose were losing 8 pounds in a single week, and that's just ... usually the last 10 pounds is a slow go, and that's okay. That's expected. But people were losing weight at such a huge rate that it was immediately evident to me that we needed to explore this a little bit more. What would happen is people would lose 10 to 18 pounds in a week, and they would contact me and say, "Can I do another week? How do go about continuing this plan?" So, I quickly modified it for people to be able to go on it for as long as they wanted, and people were continuing to lose large amounts of weight very, very quickly and in a really healthy way. When it came time to write my next cookbook, it was just obvious to myself and to my publishing house that this was what I needed to write about. What I'm most excited about is that when people think detox, they think, "Oh, I have to starve myself" or "All I'm gonna do is drink juice for two weeks". But the food, you have so much food that people contact me, and they say, "I couldn't finish my lunch. What do I do?" What I love to encourage people to do with this book and with the detox week is to eat so much metabolism boosting, healthy foods that your hunger receptors are turned off, your metabolism is roaring, and your body just takes over the weight loss for you. It's just natural, and it's easy, and it's effortless. Suzy Chase: I wanna ask you about the metabolism boosting ingredients, but first, can you refresh our memory with your wight loss story? Audrey: Oh, certainly. About eight years ago, I lost 150 pound in 11 months, and I've kept it off now for eight years, but just like any other person, especially us ladies, I do fluctuate from time to time 10 pounds up and down. That's when detox week came into play for me was if it did gain a little bit of weight or if I did feel extra bloated and gross and I had a TV show to go on, I would lean on the detox week, and it would just be immediate. The weight would fall right back off. It would reset my taste buds to be craving the healthier foods and to reset my metabolism. The weight loss originally started with the first weight loss plan, "Lose Weight by Eating", which you can find on loseweightbyeating.com or in my first cookbook, "Lose Weight by Eating", but this next plan is based off of the first one, and it's all about taking out the processed foods, the fake sugars, drinking more water, moving your body a little bit more, and planning out your meals so that you know something yummy is coming for dinner, so you're not going to over indulge at lunch kind of a thing. Suzy Chase: Tell us about metabolism boosting ingredients. Audrey: Oh, I love my metabolism boosting ingredients, and I love to point them out to people. I go to restaurants, and my friends are like, "All right, you don't need to point that out, Audrey." There are a lot of ingredients out there, and they're always gonna be the all natural ingredients, are gonna help to boost your metabolism. Anything with Vitamin C in it is naturally going to boost your metabolism. Immediately when we think Vitamin C, we think of citrus, and yes, that's a big one, but also berries and lots of different greens such as spinach and broccoli will all naturally boost your metabolism. With a lot of my recipes, you'll see I'm using a lot of bell peppers, and that's partially because I love them and also because they're really great at boosting metabolism. And once you cook them down with some onions, which are also metabolism boosting, you won't really be able to taste them. If you think about fajitas, you think, "Well, that can't possibly be healthy", but it really is depending on how much cheese, of course, you put on top if it. But if you were to make fajitas at home and you were to throw in an extra onion and throw in an extra bell pepper and make it all caramelized and yummy like we all love them on our fajitas, people are thinking that they're indulging because it picks up all the flavors of the steak and of the shrimp. And I'm speaking of my Surf and Turf Fajitas here in the new cookbook, "Lose Weight by Eating: Detox Week", but what you're doing is you're just filling your body up with all of these great metabolism boosting ingredients. Your body just does it all for you. Of course, we wanna exercise. It's great for our body, but if you can eat the foods that tell your body to shed weight, that's the easiest way to go. Suzy Chase: In terms of snacking, talk about fruit vs. the hundred calorie packs. Audrey: I love talking about this, Suzy. I'm so glad that you brought it up. Those hundred calorie packs, I am not a fan. Suzy Chase: You want two more. Audrey: ... "They're only a hundred calories, so I'll have another." Exactly. It's just they're empty calories, and they're packed full of fake sugars. Say for instance you're getting the hundred calorie packs, and they're the sweeter items. They're gonna have fake sugars in there that are gonna tell your body to hold onto weight to store your fat. But if you were to have a piece of fruit instead, say if you were to have a bowl of berries, that's going to go ahead and crave your sweet tooth, and it's gonna naturally boost your metabolism. Plus, your body knows what to do with the real sugars found in fruit. Your body does not know what to do with fake sugars made in a laboratory. And just kind of going back to nature and feeding ourselves the way our bodies expect to be fed instead of feeding our bodies out of a laboratory. Suzy Chase: And I've heard you say that a banana takes up as much as room as hundred calorie pack in your bag. Audrey: Oh, absolutely. Yeah. And it has its own natural little packaging, too, which I love. I almost always have a banana in my bag. I'm a mommy. I have an eight year old, and so I've always got snacks in my bag. I'm always picking up bananas at the local produce area at my grocery story, and the produce manager knows me. But I've always got a banana in my bag because it takes up the same amount of room, if not less because in our purse it fits a little bit better there than a hundred calorie pack. And you've always got a healthy snack, it's already prepackaged for you, and it's so good for you. It's got all that potassium, it's going to turn off your hunger receptors, it's so much better for you than just junk food. And the calories, it's just about the same amount of calories as a hundred calorie pack. However, it's going to benefit your body where the hundred calorie pack, it doesn't do anything for your body. Suzy Chase: So, here's the big question. What is the key to losing weight and eating what you want? Audrey: I love that. Suzy, you've already read my first cookbook, "Lose Weight by Eating". I love food, and my whole philosophy on food is I wanna be able to eat something really yummy, three meals a day plus snacks, and so if I can't make it skinny and healthy, I'm just gonna have the real thing. Through my first cookbook, I tried to create healthy onion rings, and I finally gave up, and I was like, "You know what? I'm just gonna go and get myself some onion rings and get over it." Because from time to time, I'm not going to be able to find the healthier version of it. But if it can, then I am going to try as hard as I can. Like I said, I tried 10 times with those onion rings. But I'm going to make it in a healthy new way so that I can splurge as much as I want. In this new cookbook, I've got chili, and I've got potato soup, and I've got my caprese pesto sandwiches where I hollow out the rolls so that I don't have as many carbohydrates, but I have lots of cheese and veggies and yummy homemade pesto. So, I try to take out some of the extra carbs or some of the extra ingredients you might not need and make it in a healthy new way. Specifically, my vegetarian lasagna that's in the new cookbook, most people never realize whenever I make it for them that it's healthy even thought it's over 50% veggies. I like to trick your taste buds into eating healthy. And like I said with my onion ring story, if it doesn't taste as good as the full fat version, it's not gonna be in the cookbook. I'm just not gonna your time or your money or disappoint your taste buds. Anything in the cookbook will be as good as the full fat version. Suzy Chase: To give us a little boost, you suggest we use your detox water. Audrey: Yes. I started out making fruit infused waters many, many years ago, and it kind of blew up on the Internet, and that's pretty much where "Lose Weight by Eating" made its mark was fruit infused waters. I'm pretty sure everybody listening right now has heard about them at this point. I was a big pioneer in the fruit infused waters. As I started writing more recipes and learning more about ingredients, I realized not only is water going to boost your metabolism, but so are many of these ingredients. For instance, my cucumber, lime, and mint water that's in this new cookbook, the cucumber is gonna naturally reduce bloat as will the mint, and the lime is going to naturally boost your metabolism. So, you're having a yummier way of enjoying your waters, but you can drink lots and lots of water, boost your metabolism, clean out your system, keep you full. But by adding in these ingredients, you're also benefiting your body in other ways by reducing bloat and boosting your metabolism even more. So, I've got lots and lots of yummy waters in this book. The pineapple strawberry infused water, Suzy, is so good, and it's great for curbing a sweet tooth. It's got lots of metabolism boosting ingredients. And in this book, I also came up with a few sodas. There's three soda recipes, so you can make a homemade strawberries and cream soda or mojito flavored soda, and you can feel like you're over indulging, and you can curb that soda craving and your sweet tooth all while boosting your metabolism and doing something really healthy for your body. Suzy Chase: You were on the Rachael Ray show last month, and you made a giant breakfast cookie. Describe that. Audrey: I love that breakfast cookie. I've been lucky enough to be on Rachael Ray three times now, and it's really interesting. For the breakfast cookie, I was actually backstage talking to Bob Harper from "Biggest Loser", and he was so excited about being able to make that breakfast cookie with me. He couldn't stop talking about it. He was like, "How do you do this? How is this healthy?". I explained it to him, and he was so thrilled about it, and he loved them. It's like, hey, if you can get Bob Harper to love your food, that's a big deal. That's from my first cookbook, "Lose Weight by Eating", and it's packed full of good for you ingredients. So, you're going to be filling up your tummy with heart healthy oatmeal. I like to say it's basically a bowl of oatmeal baked into a cookie. For those of us who aren't the biggest fan of eating oatmeal in the morning, what about if it was a cookie? And so that's kind of what "Lose Weight by Eating" is about. You're gonna be enjoying things, and you don't realize that they're healthy. Suzy Chase: How's Bob Harper doing after that crazy heart attack? Audrey: He's strong. He just came out with a new cookbook. He's just a great individual. I adore him, and I love being able to work with him. But he seems good. He's a tough guy. He came back really quickly. Suzy Chase: There's a whole chapter called "Salad Wraps", and your favorite is the Spring Rolls with Peanut Sauce. I find that I can never get the hang of rice paper. What is the trick? Audrey: Oh, man. I love that you brought that up. I just recently did a Facebook live on how to make them because it's really daunting the first time that you work with rice papers. I love to tell the story in the book that the first time I worked with them, my daughter, she was only seven at the time, she kicked me out of the kitchen. She was like, "Move on over, mom. I got this." I feel like it always seems very daunting to work with them, especially if you've never done it before, but my tip is if you mess up, take all of the stuff out of them, just dump the filling back into the bowl and throw the rice paper right back in water. What typically happens with rice paper is it sticks together kind of like tape does, but unlike tape if you toss it back in the water it all comes together in a perfect little round again. So, I did give some tips, and I did show you how to roll them up on my Facebook page, Lose Weight by Eating with Audrey Johns, but you know, hey, if a seven year-old can do it, absolutely anybody can do it. Just toss them back in the water and keep working. Suzy Chase: Okay. I'm trying that this weekend. Watch out world. Audrey: ... and I'm pretty full after having the four, but I have to hide the other four in the back of the fridge because I can't stop. They're so, so yummy. Suzy Chase: What should we do if we go out to eat and happen to go overboard? Audrey: That happens to pretty much all of us, including me. I love to recommend whenever you do go out to eat, plan ahead so that you know, okay, this is what I'm going to order. But if you do go overboard, I just recommend get over it. Life is short, and you're going to mess up. Very often people trying to lose weight will blow their diet on an extra slice of chocolate cake or by going overboard when they go out to eat, and then they say, "Okay, well, I'll start again on Monday". And that's when you're really losing out. The messing up and having the extra slice of cake, that's not a big deal. We all do it, and that's going to happen to all of us, even to me. I have definitely gone overboard, and I will probably go overboard again at some point this month. But the way that you can succeed with weight loss is just get over it. Don't deprive yourself from your next meal. Don't say, "All I'm gonna do is have smoothies tomorrow". Just get over it and get right back on the bandwagon, and the very next meal should be healthy, and it should be back on plan. But if you say, "Oh, I'm gonna start again on Monday", then you're gonna end up eating so many extra calories between, say it's Tuesday that you blow your diet and you wait all the way until the next Monday, you're missing out on all of these days. Just get over it and move on. Suzy Chase: A few days ago, I made your recipe for a "Bruschetta Pasta in Bed" on page 189 from your "Date Night and Family Dinners" chapter. Okay. This is just a few ingredients. It's spinach pasta, olive oil, garlic, tomatoes, basil, green onions, and Parmesan. But it packed so much flavor. Audrey: Absolutely. And it's just like I said, Suzy, I want these recipes to be very, very flavorful and really, really yummy. I love that I was able to do a date night chapter for this book. Of course, I like to giggle and laugh, and yes, it's called "Bruschetta Pasta ... in Bed", but my daughter loves it. We make this, and we sit down in the living room and watch a kid's movie while we're eating it, as well, from time to time. But I do. I love to pack all of recipes full of as many flavors as possible because there's nothing worse than bland diet food. Nobody wants that. I don't want that. This is one of my all time favorite recipes. From time to time, I'll throw in some cubed chicken, as well, if you wanna little bit of extra protein, but it's only 302 calories, and it's over a cup. It's a cup and a quarter of pasta. It's a lot of pasta. And you've got lots of basil and lots of tomatoes. It's just really, really full of flavor. And, of course, Parmesan cheese, so I really recommend anybody who's craving pasta, this is a great opportunity to have real pasta and really enjoy it. Suzy Chase: Talk a little bit about your "Date Nights and Family Dinners" chapter. I love it. Audrey: I love it, too. I love it, too. With the book, there's definitely a lot of smoothies and salads and health food, but I wanted to include a lot of things to impress, meals to impress your date or good family meals when you have your mother-in-law coming over and you wanna be able to impress her. So, I've got different meals like my "Chicken Cordon Bleu with French Bistro Salad" I got to make with Rachel Ray a few weeks ago, and she couldn't get over it. She was so excited about it. Because it's also family night as well as date night chapter, there's avocado club cheeseburgers with sweet potato fries in there, as well. I want to give you with those yummy meals that will impress, that will work for both date night so that you can put the kiddos to bed early and enjoy a nice date night. And as a reminder, Valentine's Day is coming up, and it's right in the middle of the week, so hey, why not have an at-home date night. Buy yourself a nice bottle of wine and put the kids to bed early and save a lot of money and a lot of calories and do it yourself at home. I definitely recommend the brushcetta pasta, the spicy Kung Pao chicken for two is also really fantastic and just spicy enough that you wanna feed the kids something else, put them to bed, and enjoy it with a nice glass of white wine. Audrey: Online you can find me at loseweightbyeating.com. You can also find me on Facebook at Lose Weight by Eating with Audrey Johns. Like I said earlier, Suzy, I've been doing a lot of Facebook lives. I think maybe I'll have to choose one of these date night meals to do soon considering Valentine's Day is coming up. Audrey: Yeah. I think I'm gonna have to figure one out. But yeah, you can find me there, and I try to do my best to answer lots of questions on Facebook, so put your questions up there on the most recent posts, and I check them a couple times a week and answer questions. Suzy Chase: Terrific. Well, thanks, Audrey, for coming on Cookery by the Book podcast again. Audrey: Thank you for having me again. 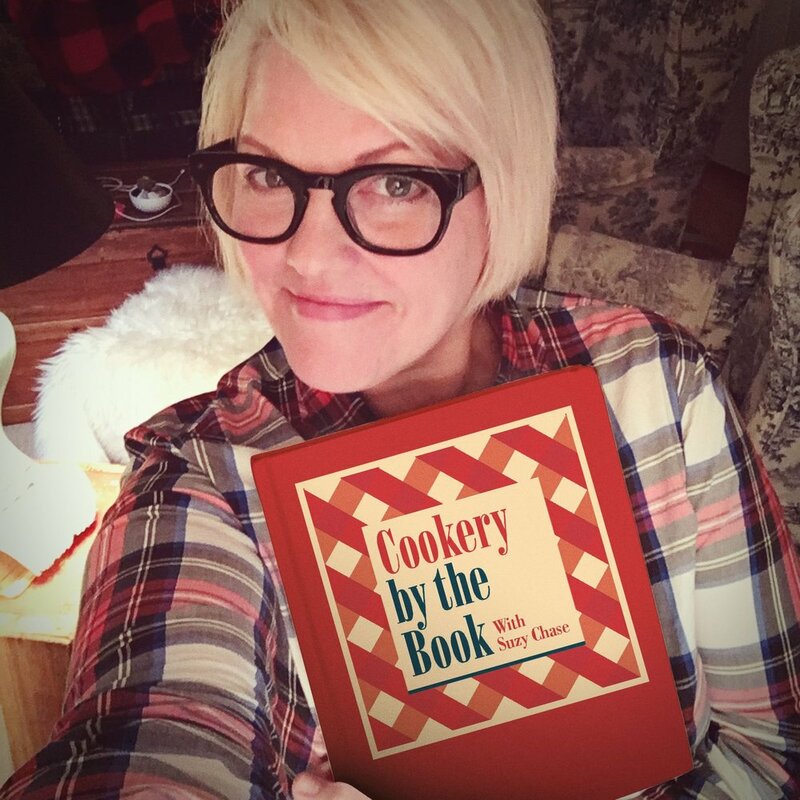 Suzy Chase: Follow me on Instagram @CookerybytheBook, Twitter is IamSuzyChase, and download your Kitchen Mix Tapes, music to cook by on Spotify at Cookery by the Book. And as always subscribe in Apple Podcasts.